This paper describes two experiments in building Virtual Worlds for educational use on the Internet. The main part of the paper details TheU Virtual University, an experiment conducted by Contact Consortium, which works from outside existing educational organizations. It deals with the collaborative construction of 3D multi-user online virtual campus spaces. The lessons learned may guide future efforts in that direction. In addition, we summarize a modest experiment, the BOWorld, carried out at a Dutch university. Both experiments underline the importance of using the concept of virtual (imaginary) organizations or systems in relation to the change and transformation of educational systems. Keywords: interactive programs, Virtual Worlds, virtual communities, virtual organizations, imaginary systems. Since 1995, the Internet has played host to a dozen different emergent technologies supporting two- and three-dimensional multi-user graphical Virtual Worlds. These spaces have been shared by and bear the marks of tens of thousands of users who enter them daily, each donning a digital embodiment known as an ‘avatar’. Avatar is an ancient Sanskrit term meaning ‘a god’s embodiment on the Earth’. Chip Morningstar first applied the term to online personification in the Habitat project in 1985 (Farmer, 1991). As we shall elucidate, the use of multi-user graphical Virtual World platforms can be an important aspect of transforming educational systems into what policy and organization sciences call virtual or imaginary organizations and systems (Hedberg et al., 1997). The imaginary organization is a perspective which shows us how organizations, which can utilize imagination, information technology, alliances, and other types of networks, are able to organize and sustain a boundary transcending activity. (Hedberg et al., 1997: 14). With only a small core of employees, the imaginary organization can have, because of its vision, the employment of all kinds of networks and by being trusted by many involved individuals, an impact far greater than you might expect from its formal size. From a sociological point of view, you could say that the imaginary organization is based on integrative forces other than the traditional organization. Trust, synergy, and information technology are high on the list of those forces. Although information and communication technology (ICT) is not a prerequisite, normally ICT will facilitate the rise and growth of imaginary organizations. An example of an imaginary organization is Contact Consortium (CCON), established in 1995. It acts as the focal point of a virtual organization, which serves as a catalyst within online Virtual Worlds, stimulating their evolution, and experimenting with practical uses for these shared spaces. Contact Consortium is especially focused on creating social/creative Virtual Worlds in the area of learning, rather than designing gaming or entertainment spaces. These worlds have typically relied on the inhabitants themselves to build up the community structure, economies, and visual virtual real estate, rather than presenting a more limiting content prescribed by a small set of designers. Contact Consortium is also an innovative force outside the formal educational systems, which seeks to transform education by using Virtual Worlds. This paper details the first phase of an experiment by describing the Virtual World project ‘TheU Virtual University’. 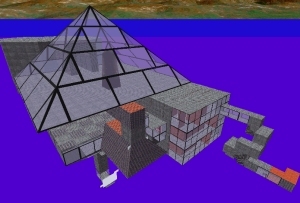 Organizations that provide platforms such as The Palace and Active Worlds (AW) (Damer, 1998), promote the educational use of Virtual Worlds with low prices and special facilities, such as the offer to use a virtual space at no cost in a try-out period. Because of such incentives, and the relatively user-friendly technology, the proliferation of Virtual Worlds is a real possibility at all levels within existing educational organizations. The use of a Virtual World doesn’t need to be part of the central ICT policy of the educational organization. In this paper, we document a small experiment at the level of departments within the university, namely, BOWorld, in the field of Policy and Organization Sciences at Tilburg University in The Netherlands. This paper has three parts. The first part, sections 2 and 3, describe, in a rather general way, the roots and technical underpinnings of the online graphical multi-user Virtual Worlds. The second part, sections 4 and 5, document the two experiments. Section 4 details the experiment with ‘TheU Virtual University’. It highlights two types of interaction processes: the cooperative activity of designing the architecture of the Virtual University and the way the activity of judging them is organized and hosted on the Internet. Section 5 summarizes the experiment with BOWorld. Here we focus upon the technical, as well as the social problems we encountered while searching for useful educational functions for the BOWorld. The perspective of the virtual or imaginary organization ultimately proved to be quite useful. The third part, section 6, concludes with some thoughts on the future of Virtual Worlds in cyberspace. Virtual community finds its technological roots in the earliest text-based multi-user games, such as Space War, a popular application within the early development of Unix. Continuing this trend was the development of UseNET, LISTSERVs, MUDs, MOOs, IRC and conferencing systems like the WELL in the 1970s and ’80s (Rheingold, 1993), and the World Wide Web and its many progeny in the ’90s. The merging of text-based chat channels with a visual interface in which users were represented as ‘avatars’ occurred first in Habitat in the mid-1980s (Benedikt, 1991) and reached an important watermark with the launch of the 3D Internet-based Worlds Chat in the spring of 1995. Although one would suppose that the rise of ‘inhabited’ 2D and 3D visual spaces in cyberspace would have been heavily influenced by the prior example of Virtual Reality (VR) systems and be closely connected with the development of the Virtual Reality Modeling Language (VRML), this was not the case. Inhabited Virtual Worlds and their communities drew primarily from their roots in MUDs and text-based real-time chat systems, and they utilized the power of existing 3D rendering engines developed for gaming applications, such as Doom and Quake. Next, online Virtual Worlds do not take advantage of the full immersion and special devices of VR systems but instead concentrate on running effectively on a large range of consumer computing platforms at modem speeds. 3	Technical underpinnings: How do you build a world? The technology involved in serving up an inhabited Virtual World experience is extensive and impressive: from robust client-server architectures, to streaming 3D object models, to tricks dealing with latency, to citizen authorization and crowd control, and finally to databases managing, and mirroring hundreds of millions of objects and thousands of users across networks at modem dial-up speeds. These virtual spaces represent one of the great architectural achievements of computing. We invite you to view the image of one particular cityscape, referenced in figure 1. 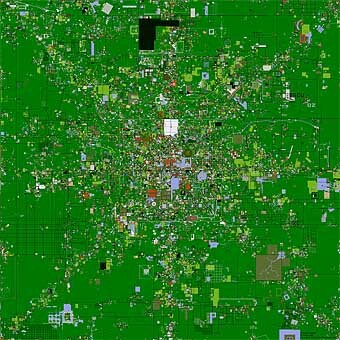 This ‘satellite view’ of the AlphaWorld cityscape is actually an artful processing of the database of 3D content that was placed down by some of 200,000 users in the first 32 months of operation beginning in the summer of 1995. 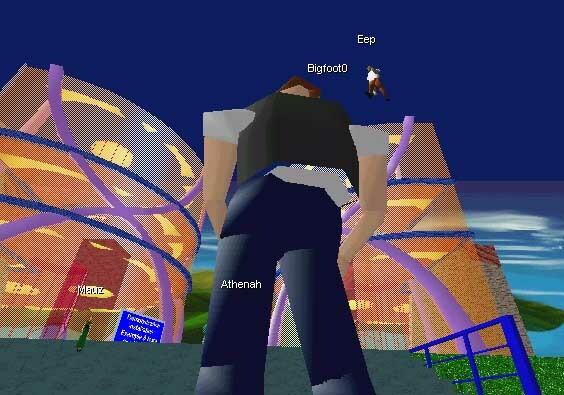 Currently over 50 million objects occupy AlphaWorld, which can be visited by users with ordinary consumer computers ‘walking at ground level’, streaming in a visible periphery of 3D content over modem connections. The literature surrounding Virtual World architectures, community development (Damer, 1995, 1996, 1998; Powers, 1997) and avatar design (Wilcox, 1998) is comprehensive and growing, so we will not treat these topics further here. The grandfather organization of the Contact Consortium is CONTACT: Cultures of the Imagination, a group of Anthropologists, space scientists, artists and writers, established in 1982. CONTACT created projects in honor of Gregory Bateson, projects which involved learning through contact exercises with simulated cultures and their worlds. A team led by Northern Arizona University anthropology professor Reed Riner created one such Bateson project, SolSys Sim. In SolSys, separate campus teams of students and virtual consultants designed and documented solar system human civilization projected one hundred years hence and then went live in a MUD text-based simulation of contact between these ‘colonies’ (Riner, 1994). SolSys was highly successful as a learning environment, garnering international recognition and graduating scores of dedicated alumni over its eight years of operation. Starting with students of the University of Toronto’s Marshall McLuhan Program in Florence (Italy) in May of 1996, a group of Contact Consortium set out to build on the legacy of SolSys by creating a learning space appropriate to a 3D online inhabited Virtual World. A dedicated Active World server, TheU, was donated to the Contact Consortium for special experimentation in education. The goal of TheU is to serve as a test bed combining traditional campus-based universities and the growing number of distance learning projects. Distance learning offers many advantages to students in remote areas and students attending part-time courses. However, it lacks the social interaction and sense of community, which can be achieved by sharing environmental spaces and experiences. This technology may trigger the emergence of completely innovative teaching methods. Given its unique combination of social interaction, visual human embodiment and user definable virtual environments TheU sought to go beyond current networked learning experiments. Playing it safe for our first experiment, we opted to stay with familiar metaphors of a university campus with its instructional spaces, tutorial help centers, social commons, and library reference zones. In order to utilize the power of the Active Worlds builder community, we decided to host a virtual architecture competition thereby generating a range of approaches to using a Virtual World in pedagogy. Fortunately for the organization, Stuart Gold, a British architect and database expert with a long involvement in online systems, took the lead in this effort, operating the event as a professional juried competition. Stimulate and nurture debate on the development of virtual education. Provide a research facility and forum for the development of Virtual Worlds technology. Provide information and instruction on the use of virtual environments. Act as a governing body for TheU, developing and implementing policy decisions. The first faculty was comprised of the panel of judges for the design competition. The panel was made up of educators, architects, artists/designers, and technologists including: Murray Turoff from the New Jersey Institute of Technology, Marcos Novak from UCLA, Derrick Woodham from the University of Cincinnati, Gerhard Schmitt from the ETH in Zurich, John Tiffin of Florida State, Bruce Damer, Stuart Gold, and others. Suitability and usefulness as a space to house and facilitate the functions of the institute. Innovative application of Virtual Worlds technology and other emergent technologies such as web casting. Use of space and objects to create a stimulating, aesthetically pleasing and compelling environment. Participants were given a large degree of freedom in their interpretation of the requirements. As the driving technology is so fluid and is constantly evolving, we felt that the participants should evolve their ideas over the period of the competition and have access to a consultative panel of experts, who would also be the judges, via a listserv available to all the entrants. There were 34 teams; each was given an Active Worlds personal server donated by Circle of Fire and hosted by SRT Enterprises. Each of the servers was configured to allow any Active World user to enter but only one can build in the world. The duration of the competition was around six weeks. Due to the open-ended nature of the requirements and the emphasis on ideology and innovation, the participants were encouraged to develop one or more Web pages, linked to their schemes, which served to describe their designs and the concepts behind them. Participants were encouraged to outline how their designs related to the learning and educational process. A competition pavilion was constructed in TheU (figure 3) and served as a communal area for all the participants. In it were teleports through which visitors and competition judges could enter each of the worlds. 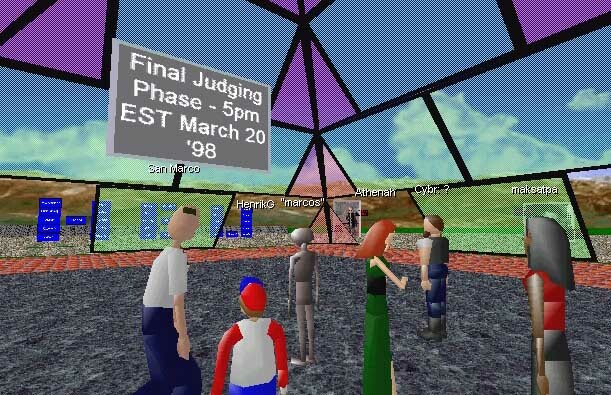 The event had a clear structure, advertised from the beginning: meeting in the Pavilion, a tour of the six finalist worlds, with the judges, narrated by the builders of the worlds. Strict control of the pacing, moving on between each world every 20 minutes. A final gathering at the pavilion, voting and announcement of the winners by placing banners in the pavilion for all to see. Assignment of gatekeepers and guides: we had trained world users at the pavilion to guide newcomers and folks who crashed their software, back into the live tour. They used private telegram to stay in constant contact with the event leaders. A pair of event leaders, in charge of herding of attendees, crowd control, discipline of event crashers, communications with gatekeepers and generally keeping the conversation interesting and on track. Documentors were logging all text chat and taking a continuous series of screen shots of the walk through, which can all be seen at http://www.ccon.org/theu/album-background.html. Voting of judges was by secret ballot, sent by telegram and email with follow-up after the event. The winning world Aurac was built by Craig and Penny Twining of Active Arts Design in the UK working with Henrik, a chemical engineer and 3D model constructor from Norway. Figure 4 above shows the ‘learning towers of Henrik’ being viewed by judge Murray Turoff from the New Jersey Institute of Technology. These towers were built by Henrik to share with others the techniques of constructing objects in the Active Worlds environment. Innovations in the winning world included amphitheaters with changing slide shows linked to websites, clear guidance paths and transport mechanisms allowing users to easily tour the world, and the tying in of triggered video and audio resources into the virtual spaces. All of these innovations have since been used to good effect in learning spaces in Active Worlds. As TheU competition was seen as a following in the footsteps of the original Sherwood Town experiment, we felt we had achieved some major goals including: greater consistency of the event, clear, published goals, well defined roles and concrete outputs (the winning worlds and their documentation). Did we construct a viable Institute of Virtual Education? Apart from the great aesthetic value of the winning world, Aurac, and its merit for use in demonstrations, it did not serve our needs for the Institute. Large spaces can cause users to get lost and provide a scarcity of immediate stimulating objects and other affordances to draw them on to the next activity. There needs to be a rich variety of objects close at hand, suggesting that smaller plazas function better than sweeping vistas requiring lengthy navigation. A great deal of wasted objects and real estate can result if one is trying to be faithful to the real world setting. Do not design worlds that seek to model real world places, unless those places are particularly suited to support interaction in a virtual environment. Navigation and habitation of virtual spaces is so different than the same activities in a physical setting. Potemkin villages, theme parks, town squares or shopping malls, designed for denser crowding with plenty to see and do are some of the very few real world models worth emulating in virtual space. Design worlds that are constantly changing and changeable. In fact, the ‘ground zero’ (default entry area) of TheU has become a major meeting area, filled with the changing detritus of signage, teleports and web links from prior events while the ‘museum areas’ are static and preserved only for narrative tours. Find TheU Virtual University on the CCON’s Homepage at: http://www.ccon.org/theu/index.html. TheU is a frequently used, changing world that will continue to evolve. Visit TheU on the Internet by downloading and installing the Active Worlds Browser http://www.activeworlds.com, starting the program while connected to the Internet, and then selecting TheU from the listing of worlds on the left hand side of the interface. Join the projects of the Contact Consortium by signing up on the many special interest groups lists at: http://www.ccon.org. In section 4, the birth - and first phase of the development - of a Virtual University was described as the initiative of the virtual - or network - organization Contact Consortium. A complete statistical analysis of the characteristics of the participants, such as ages, level of computer expertise and professional background, is not available. From the interviews held with some of the participants, the following was clear: they were really enthusiastic and competent users of the Internet. If you read, for instance, the interview with a sixteen-year-old participant who calls himself a veteran Internet-user and programmer, it is evident that it was not the rank and file computer user, who entered the competition. One can think of the Virtual University as an alternative, as Turoff has done, for the ‘brick and mortar colleges’. He compared these alternatives in articles such as ‘Costs for the Development of a Virtual University’ (1982, 1996). In section 5, we look at the problems and promises of introducing and using Virtual Worlds in existing, primarily bureaucratic organizations. In such organizations there is a central ICT policy, a standard for the use of computer programs, and cost-sensitive replacement policies for computers, which results in technical specifications that are not state of the art. But even more important, real universities are not inhabited by the computer enthusiasts of TheU Virtual University Competition. The approach of using Virtual Worlds in bureaucratic organizations is also a realistic one and worthy of study. In recent years, we have seen in The Netherlands, at all levels of the existing educational system, modest attempts to experiment with Virtual Worlds in relation to education in normal educational organizations. At the primary school level, De Wereldschool, an organization that provides long distance education for Dutch citizens who work abroad and whose children are unable to go to school, is right now doing a feasibility study to use a Virtual World as the primary interface between the educational center in the Netherlands and the dispersed pupils. At the secondary school level, a Montessori school in The Hague has taken the lead by using an Active Worlds’ based Virtual World as a learning environment. At the university level, the Department of Policy and Organizations Sciences of Tilburg University experimented with BOWorld, also using Circle of Fire’s Active Worlds as a platform. Like all universities in the Netherlands, Tilburg University spends a lot of time and money on ICT. For the various departments, educational ICT is, however, something that is initiated at and comes down from the central level. It is, for instance, not unusual that departments don’t even take the trouble to update their own web pages. The lack of interest of departments is one of the problems of implementing ICT policies in universities. One incentive for the departments of Dutch universities to pay more attention to ICT in the educational process comes from the Dutch quality assessment system. The system, which has been in operation since the eighties, requires that every curriculum is reviewed (‘the visitation’) every five or six years. The use of ICT in their courses is one of the topics on which a curriculum is evaluated. In 1997, the Committee on Education of BOW used the external impetus of the upcoming inspection of the curriculum of BOW at Tilburg University to found an educational committee (ELO) to promote ICT within its curriculum. Policy and Organization Sciences is a part of the faculty of Social Sciences. Normally, this type of department is not ICT oriented. Without the active involvement of staff and students the new activities would certainly fail. Therefore, ELO spent a lot of time on researching the needs and demands of the staff and students, to prevent resistance to the rise of ICT in the educational process. The objective for the first phase was to build a cost-effective Virtual World to demonstrate the range of possibilities and to mobilize involvement for the further development of BOWorld. The fact that a Virtual World could be bought at low costs – a mere 300 dollars for a one-year-subscription - and quickly, and therefore cheaply, could be constructed by using pre-fabricated models, was a surprise. In the first phase, the BOWorld wasn’t supposed to be a well-organized whole, but more like a bazaar, with a wide-range of possibilities. For instance, the fact that it was possible, by using a Frames Approach, to combine web sites and Virtual Worlds, was, for demonstration purposes, a valuable ‘show piece’. The third part of the objective was the most difficult one. An obvious approach to promoting the involvement of students - and staff – was to let them take an active part in building the world. Here we encountered our first major disappointment. Lack of time and low levels of ICT expertise prevented student participation in the project. A lot of our students, and also staff members, are only marginally interested in and experienced with ICT. One person, Dirk-Jan de Bruin, built the BOWorld. In the first phase, we also encountered some technical problems. Because of the ‘firewall’, communication was only possible within the university. In 1998, this problem was solved when the Circle of Fire released Active Worlds 2.0, which used a UDP-protocol instead of a TCP- protocol. Various other problems had to do with the fact that bureaucratic organizations have a lot of standard procedures and strict norms. The only place where a lot of students have access to the Internet is the central library of Tilburg University. Because of the central ICT policy, students could not install the AW browser at the library computers. Therefore, a large-scale experiment to demonstrate the interaction capacities of the 32-simultaneous-user-world could not be organized. One of the core activities of each department is their contribution to the working processes of the educational system: teaching courses. The first thing was to look for courses where simulation of interaction like you can achieve in a Virtual World could be employed. BOW considered gaming and simulation as exercises for policy and organizational processes (Geurts, Jolderma, Roelofs (eds. ), 1998). For precisely that purpose INSEAD, a school of Business Management, used ‘scenes’ built in the public Alpha World (Angehrn & Nabeth, 1997). The most obvious point of entry for the application of BOWorld was the growing number of courses where gaming and simulation played a role. The ELO committee discovered quickly that BOW, because of its small staff and many students, lacked the time to follow the example of INSEAD. Traditional methods for gaming and simulation, such as role-playing using written instructions and cardboard playing fields, are still in use in BOW. Another point of entry was to look for an educational technology that can be combined with – or integrated within – the use of a multi-user graphical Virtual World environment. In BOW’s courses, the Electronic Meeting Room (EMR) is sometimes used. This facilitates decision-making by using a local network of computers and groupware. Because everybody is in the room at the same time, participants can also interact face-to-face. Currently, however, BOW is not concerned with integrating the EMR-concept with a graphical Virtual World, or with the Internet as such. In the literature, the case for learning through the Internet, with or without the use of a Virtual World, is always linked to two concepts: the concept of dispersion and that of asynchronicity. Both concepts are normally used in relation to distance learning. A lot of BOW students were, in fact, part-time students and some preferred distance education, because of the travel time to attend the courses. This did not mean, however, that BOW felt a need to invest in ‘asynchronous learning networks’ (ALN) (Hiltz, 1995). In the end, neither the argument of dispersion of the students, nor the need for asynchronous learning, favored the use of a Virtual World. The final conclusion after the first phase was that BOWorld could not yet play a role within the core educational processes of BOW. Are there other social functions related to the educational system which are appropriate for BOWorld? When we think of Virtual Worlds, we must not take the notion of ‘reality’ too serious. In an earlier section, we claimed that various metaphors can be used to direct your thinking while designing a Virtual World. The fact that the design process is, for instance, denoted as an architectural process, will influence your thinking by the metaphors it suggests, namely, the metaphors of space and place. Metaphors of space/place (room, campus, world) are, of course, only one kind of metaphor we live by (Lakoff & Johnson, 1980). If we use metaphors in the design process, we can go backward and forward between metaphors of structure – physical (space/place) or social – and metaphors of function. The metaphor ‘Virtual Classroom’ combines a space metaphor (room) with a metaphor of function (teaching courses). ‘Virtual University’ also combines a space metaphor (campus) with educational functions, although the relation is not as specific and on a different level than the metaphor ‘Virtual Classroom’. Some browsers prefer the metaphor of a ‘room’ (chat room), for instance WorldsAway and The Palace, while others, like Active Worlds, are not so committed to that metaphor. In Virtual Worlds, normally a person (avatar) has a fixed aura around him or her. This is an awareness mechanism which allows persons at certain ‘distances’ to see and talk to each other. Awareness is a prerequisite for interaction. Sociologists also find it important to have a seclusion mechanism. In cases where the room-metaphor is used, this mechanism is more or less built in the basic design. In a fundamental ‘open society’ like Active Worlds, social seclusion must be achieved in other ways. In short, if you focus on a certain type of educational function, it will steer your architectural design and eventually the type of Virtual World browser in which a certain metaphor is incorporated. At the course level, the room metaphor is very suitable. The metaphor ‘Virtual University’, designed as ‘an open society’, can fulfill internal and external functions. ‘Virtual reality’ is, as the sociologist Durkheim would call it, a ‘reality ‘sui generis’’ – a reality of its own. This applies, of course, also to the ‘Virtual University’. We can consider the ‘Virtual University’ as a manifestation from an underlying social reality, namely the ‘virtual organization’. In our introduction, we linked in that vein the virtual organization Contact Consortium to TheU Virtual University. It is now time to expand the argument and to link it to BOWorld. : if a world can not be used in the internal, primary processes, look for external and boundary-transcending functions and interaction processes. Our question is, can BOWorld be used as an instrument of public relations and as a cohesive force in the information processes directed at future students? A potential second phase for BOWorld? The virtual organization builds a boundary-transcending involvement based on vision (ideology), trust, and loyalty as cohesive forces, in addition to the classical utilitarian motives. An attempt to build and maintain such cohesive networks with persons outside the university focuses on two categories. The first is the category of the alumni. Universities have always invested in that category. The other is the potential student. In the Netherlands, it was, till the eighties, ‘not done’ to influence the choices of potential students. Nowadays, a lot of marketing techniques are being used. Besides advertisements and informative meetings at the university, universities also employ techniques to establish a relationship before students enroll. Sometimes, potential students may use the subsidized sport facilities at the university a year before they are officially enrolled. ICT is also an instrument in the Public Relations battle. In addition to incidental activities, there is always the possibility for potential students to access the university’s website. As an instrument of public relations, the problem of the website is the lack of interactivity. To make a more exciting impression, Tilburg University experimented with a kind of ‘Virtual University’ on a CD-ROM. But why not use a Virtual World? Even a modest Virtual World like BOWorld has a lot of interesting features. If we use metaphors while thinking about the university, ‘ivory towers’ comes easily to mind. In contrast to that metaphor, a Virtual University - or in the case of BOWorld a part of it - is a very open, friendly, and inoffensive place. 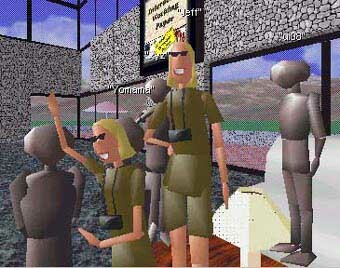 The avatars, looking like figures from a cartoon, lower the level of entrance to the Virtual University, the manifestation of the 'real world' university, even further. This is totally different from that other famous metaphor of a Virtual World, Plato’s ‘psychic prison’ (Morgan, 1986: 199). From inside the Virtual World, websites and other means of communication can be accessed. So the world of fun, chat and exploration can be combined with serious information. On the basis of the above considerations, we planned the second phase for 1998. BOWorld would become an additional instrument in the BOW toolkit to attract potential students and to create a kind of relationship on an ongoing base with potential students. Our intention was to do the additional building in collaboration with a few selected secondary schools. We planned to monitor the process intensively. We totally agree with Schroeder (1998) that empirical research of Virtual Worlds is necessary, but also difficult. However, in 1998, the faculty was involved in a very large-scale reorganization and further activities connected with BOWorld were temporarily suspended. The lessons learned complement each other in the two experiments. The case study of the TheU Virtual University taught us some lessons about rather long sequences of interaction within a Virtual World, such as building a world and hosting an event, and some design rules for their architecture. The BOWorld case study shifted attention to the social acceptance of a Virtual World within and outside the university, highlighting the social problems and promises in relation to the dissemination and utilization of Virtual Worlds. The low cost of Virtual Worlds, employing browsers like Active Worlds etc., permits you to design your Virtual World for a specific public. If you do 'consumer research', the special interests of the target group can guide the design. If you take your target group seriously, you must keep in mind their resistance to change and the relatively simple ICT environment with which they are familiar. Choose a simple platform for your world, which will work within the existing ICT environment. The argument that a certain Virtual World will only perform well within a changed ICT environment does not hold up in the dissemination and utilization game. If you introduce a Virtual World, a safe procedure is to go from the periphery of the educational process, for instance by using it as a social interface between the university and potential students, to the core processes, the teaching of courses. Potential students belong to a social category with a lot less resistance to Virtual Worlds than the average teacher. Also, the tolerance for shortcomings in the design and operation of Virtual Worlds is greater if we start with the more peripheral educational processes. The constructivist approach makes us aware of the ‘generative metaphors’, which are an intrinsic part of the design process. The fact that we are now moving from text-based Virtual Worlds to worlds with 3D-graphics will only make the metaphorical component in the design process more important. The metaphors of place (space, room, and campus), seen as metaphors of structure, should be, however, connected with those of function. Inhabited Visual Virtual Worlds are a medium in search of an application, but also a phenomenon worth of scrutiny. And, as always, maybe that empirical research, by tracing intended but also unintended consequences, can be of assistance in guiding the development, in so far as a technological process ever can be guided. The history of technology assessment confronts us with a well-known paradox: if an important technology is still in its infancy, we can steer it, but we don’t know much about it; if we know a lot about the technology, it is too late to direct its development (Collingridge, 1980). At the July 1998 Avatar conference in Banff, Alberta, Canada, consensus emerged that it was too early in the medium to know how it would ultimately be used. It was felt that it was good that a "killer app" had not been identified and that "avatar cyberspace" had time to continue to evolve for its own sake and not to serve possibly inappropriate applications. Comparisons were made with the birth of important technological media of the past century. The telephone was first thought of as a way to distribute music, early film was first cast as a facsimile of theater, and the radio was considered as a method for the delivery of lectures and person-to-person two-way communication between communities. Virtual Worlds are currently split into multi-million dollar efforts in multi-player gaming and smaller social creative spaces supported as research efforts or by die-hard builders of home-brewed digital spaces. Millions of computer users have only recently acclimatized to using classic windows and icons desktop metaphors. Those users are now comfortable in dealing in a cyberspace made up of lists of text, and documents in the form of the Web. Another generation, brought up on Doom, Quake, Nintendo 64, and other environments that stress navigation through very complex, 3D spaces full of behaviors, may be more apt to demand a cyberspace that is built around the metaphor of a place, not just an interface. Will that generation bring us more into Virtual Worlds for play, learning, work, and just being? What will cyberspace look like in ten years, like Gibson’s Matrix or Stevenson’s Metaverse (Gibson 1984, Stephenson 1992) or will the document-based web and streaming video and audio spaces be the dominant paradigm? But in the end, the most important question is: How can – and will – our institutions adapt themselves to the technological prime mover? In this paper we took a rather optimistic stand. Virtual Worlds are not Weber’s ‘iron cage’, nor Plato’s ‘psychic prison’, but a rather liberating form of technology. In relation to institutional change, we connected the development of virtual - or imaginary - organizations with that of Virtual Worlds. Angehrn, A., and Nabeth, Th., 1997, Leveraging Emerging Technologies in Management Education: Research and Experiences, in European Management Journal, p. 275 - 285. Benedikt, M (ed. ), 1991, Cyberspace: First Step, Cambridge: MIT Press. Collingridge, D., 1980, The Social Control of Technology, New York: St. Martin’s Press. Damer, B., Kekenes, C, Hoffman, T., 1995, Inhabited Digital Spaces, published in ACM CHI ’96 Companion, page 9. Damer, B., sept-oct 1996, Inhabited Virtual Worlds, in ACM interactions, page 27. England, D., and Gray, Ph., 1998, Temporal Aspects of Interaction in Shared Virtual Worlds, in Interacting with Computers, p. 87 – 105. Geurts, J., Joldersma, C., Roelofs, E. (eds. ), 1998, Gaming/Simulation for Policy Development and Organizational Change, Tilburg: Tilburg University Press. Gibson, W., 1984, Neuromancer, New York NY: Ace Books. Hedberg, B., Dahlgren, G., Hansson, J., and Olve, N-G, Virtual Organizations and Beyond: Discover Imaginay Systems, Chichester: John Wiley & Sons. Hiltz, R., Impacts of college-level courses via Asynchronous Learning Networks: Focus on Students, on the web at: http://www.njit.edu/Virtual_Classroom/Papers/Async_Learn/Philly.html. Lakoff, G., and Johnson, M., 1980, Metaphors we live by, Chicago: University of Chicago Press. Morgan, G., 1986, Images of Organization, Beverly Hills: Sage Publications. Powers, M., 1997, How to Program Virtual Communities, Attract New Web Visitors and Get Them to Stay, New York: Ziff-Davis Press. Rheingold, H., 1993, The Virtual Community: Homesteading on the Electronic Frontier, New York NY: Addison-Wesley. Riner, R., 1994, NAU SolSys Sim, on the web at: http://www.nau.edu/anthro/solsys/. Schroeder, R., Heather, N., and Lee, R.M., 1998, The sacred and the Virtual: Religion in Multi-User Virtual Reality, on the web at: http://jcmc.huji.ac.il/vol4/issue2/schroeder.html. Stephenson, N., 1992, Snow Crash, New York NY: Bantam Spectra. Turoff, M., 1996, Costs for the Development of a Virtual University, on the web at: http://eies.njit.edu/~turoff/Papers/cbdevu.html. Turkle, S., 1995, Life on the Screen: Identity in the Age of the Internet, New York: Simon and Schuster. Wilcox, S., 1998, Creating 3D Avatars, New York: Wiley. Bruce Damer and Stuart Gold are members of the Contact Consortium. Damer co-founded the organization in 1995 and Gold headed up TheU Virtual University projects since 1996. Dr. Jan de Bruin is a policy scientist at Tilburg University. He has been chair of the Committee on Education of BOW for 15 years. Dirk-Jan de Bruin is a member of Contact Consortium and founder of Multi-Users Virtual Worlds Consortium.